The former police station in Warwick. Photo from Google Street View. Plans have been revealed for the former police station site in Warwick. The former station could become a three-storey medical centre which would combine nearby GP surgeries. What the proposed new medical centre in Warwick could look like. Image by Dudley Taylor Pharmacies Limited. The police station, which is in Priory Road, was closed in 2013 but plans for it to be demolished first surfaced in 2012. In 2012 The Courier ran a story about Dudley Taylor Pharmacies Ltd, which is based in Warwick, buying the site and planning to build a ‘state-of-the-art’ medical centre. In the same story a spokesperson from the company also commented that the medical centre could have been open 12 months after the police moved out. In 2015 plans for the former station’s demolition was granted Conservation Area consent. The new plans address that this consent has now expired but that the current building ‘has a negative effect on the Conservation Area and the setting of a number of Listed Buildings’ so the demolition would not be ‘harmful’. Now new plans have been submitted to Warwick District Council by Dudley Taylor Pharmacies Limited to demolish the former building and build a new medical centre. According to the planning documents the new medical centre would combine the Priory Medical Centre and Cape Road Surgery and as a result the two current sites for the surgeries would close. The new centre would provide 20 consulting rooms, five treatment rooms, a minor operations theatre and other facilities. Planning documents also state that Priory Medical Centre and Cape Road Surgery have more than 18,000 patients and that the current facilities are ‘inadequate’. There are ‘problems with privacy and confidentiality in the building’. There is not enough parking. There were concerns about the impact of the new building on the area because of the height compared to the current building. Addressing the concerns the planning statement says: “The public benefits outweigh the harm to the various heritage assets and, in particular, the identified substantial harm to the setting of Northgate and Northgate House. The plans would also see 41 parking spaces for the medical centre, which would be made up of 14 staff parking spaces and 27 patient parking spaces. Dudley Taylor Pharmacies Limited have been contacted for a comment. So far the plans have 34 comments in support and three objection comments. 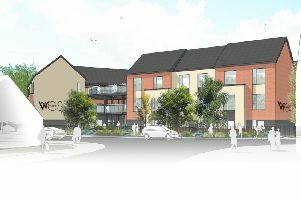 To view the plans go to Warwick District Council’s planning portal and use planning reference W/18/2111.